Beginning in Spring and ending in Fall, the motorcycling season basically exists during the warmest time of the year. Staying cool while operating a motorcycle during these months heightens the experience by increasing a rider’s comfort. Maintaining a healthy temperature also increases a rider’s safety. We covered the obvious ways to keep your temperature in check with our Warm-Weather Buyer’s Guides for Boots, Jackets and Pants, Gloves. Here we look at a few additional, but no less important, ways to manage your personal thermostat. You just have to love the creative yet simple innovation of Ventz product. Ventz allows a rider to maintain the protection a leather jacket provides while helping to exhaust the hot air that get trapped within. Portable and easily installed/removed, Ventz are a clever way in which to deal with summertime temperatures. Ventz are available in a variety of colors for approximately $31. Check out the science and order yours at Ventz.com. On the opposite end of the technology spectrum from Ventz is the EntroSys BikeAir rider climate control system – fancy speak for mobile air-conditioning. The system straps to the rear seat or luggage rack, is powered by the motorcycle’s battery and is controlled via a wireless key fob remote. Three levels of cool (or warm) air is delivered to an air-vest worn underneath your protective gear. The EntroSys retails for $1,500 plus shipping and handling. For more info or to order check out EntroSys Motorcyclist Air Conditioning System. Evaporative cooling is something your body does every time it sweats. An evaporative vest, such as the Rev’It Liquid Cooling Vest pictured enhances the process by absorbing and storing water, then releasing it over time. For best results, you’ll need a mesh jacket with air flow. When worn together the effect is truly refreshing on a hot summer’s day. Evaporative vests are available from apparel manufacturers from Alpinestars to TechNiche in a variety of sizes, styles, colors and prices. In hot weather beneath protective motorcycle gear you’re going to sweat. Replenishing lost fluids is essential to avoiding heat stroke. The easiest way to stay hydrated is having water strapped to your person with an easily available access tube for sipping without distraction while in motion. 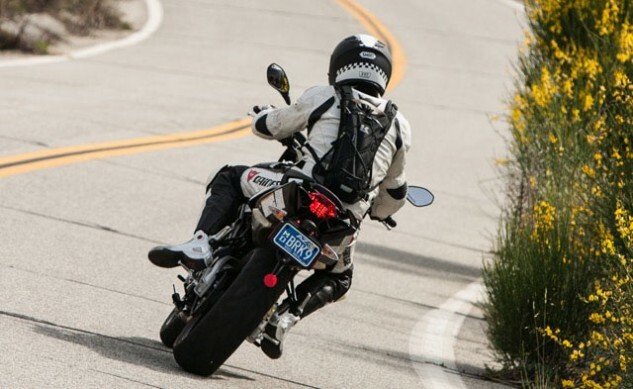 John Burns recently tested the Kriega Hydro 3 Enduro Backpack, but of course there’s Camelbak as well as other brands. Sometimes it’s just not about you. In this case it’s about your motorcycle. Without it all this other cooling stuff is without merit. Engine Ice, as well as Water Wetter and others, claim to reduce the engine operating temperature of your bike, thus improving its performance by way of reducing power loss from excess heat. Products such as these are available at your local dealer, auto parts store and online retailers. Prices vary. Internal combustion engines create massive amounts of heat that radiates upward caressing your inner thighs, buttocks and lower torso (I can think of no better example than Ducati’s Panigale). Depending on the bike and its exhaust routing, one leg or another gets a second dousing of heat from the exiting spent gases. Electric motorcycles don’t’ suffer the same heating issues. Producing electricity does result in heat energy but not to the same intensity of compressing and burning petrol. We’re not saying a Zero SR is an acceptable replacement for a Panigale, but for running errands, commuting to work and other mundane tasks in hot temperatures, why ride atop a volcano when you could be riding a first-gen microwave. Even something as simple as Aerostitch’s Kool Off Tie can provide some measure off relief in hot climes. The cotton tie is filled with water-absorbing polymer crystals which hold up to 400 times their weight in water and then releases slowly. At $6 the Kool Off Tie is incredibly affordable. Order yours at aerostich.com. The right pair of socks can go a long way in reducing the effects of the sauna inside your riding boots. Alpinestars’ Pro Coolmax Socks are constructed from Coolmax material that helps keep your feet cool and dry. The breathable, moisture-wicking material promotes evaporative cooling and helps dry sweaty feet. Hot weather socks are available from numerous apparel companies in a wide variety of prices.